Thanks to Undine of the blog The World of Edgar Allan Poe for breaking her posting hiatus with this guest entry. -ed. When reflecting upon the life and times of Edgar Allan Poe, Edward Wagenknecht once wrote that “One might also say of Poe that he lived in a Gothic novel. Hardly anybody behaves normally in this history.” Of all the names one finds in Poe’s biographies, no one better illustrates these words than Marie Louise Barney Shew Houghton. While there were many players in Poe’s life story who undoubtedly deserved to be put in the dock, (the Reverend Rufus Wilmot Griswold being merely the most famous example,) Mrs. Houghton was the only one of the lot who faced the prospect of being tried, and very possibly convicted and executed, of first-degree murder. This was the date in the year of the nation’s centennial that Houghton slipped the noose. Mrs. Houghton is known to history as having been the nurse of Poe’s wife Virginia during her final illness, as well as an all-around Poe family benefactor. This saintly reputation, unfortunately, comes largely from her own boasts on the matter, made many years after the poet’s death. In 1875, she began a correspondence with Poe’s early biographer John H. Ingram. Her avowed intent was to insure that she—as opposed to other ladies who were vying for the title—would be remembered as Poe’s dear friend and guardian angel. Unfortunately, at the time she contacted Ingram, she was clearly in appalling shape, mentally and emotionally. The numerous extant letters she wrote him—which date from January to June of 1875–are always rambling, usually incoherent, and occasionally quite insane. She related to Ingram many colorful stories about Poe that are completely uncorroborated, patently absurd, and often at complete variance with the known facts. 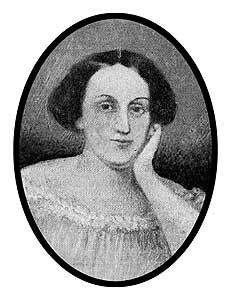 Ingram privately acknowledged that Mrs. Houghton was mentally unstable, and he suspected as well that she was enhancing, or even completely inventing, many Poe anecdotes, in order to keep their correspondence alive. He wound up dismissing her with the euphemism, “imaginative.” In spite of all this, Ingram—who was desperately in need of original source material about the ever-elusive Poe—wound up relaying far too much of her dubious information in his 1880 biography, and, even more unforgivably, Poe’s modern-day historians repeat unquestioningly this same apocrypha to this day. One wonders what Ingram’s reaction would have been if he had known anything about his pen-pal’s personal life. Marie Houghton was a predecessor to today’s “New Age” devotees. Her first marriage, to the “water-cure” practitioner Joel Shew, gave her an avenue into what were the more extreme circles of Transcendentalist faddism, which embraced alternative medicine, “free love,” “freethinking,” communal living, and disdain for established institutions. Ironically, she represented everything Poe most despised in contemporary society. In the mid-1840s, Marie Louise separated from her husband and entered into an affair with another member of their circle, Dr. Ronald Houghton, although she continued to live with Dr. Shew. In 1849, she gave birth to a son, Henry, who was probably acknowledged as Houghton’s, although at least one historian has theorized that the father was a third man who was living with (and financially aiding) the Shews. The next year, the Shews divorced and she married Houghton. Although they had several more children, the marriage proved unhappy, and they too separated. She continued to work as a nurse, while indulging in a number of extremely complicated and very dodgy financial and property transactions on the side. However, it was this son Henry who proved to be the catalyst that brought Mrs. Houghton serious trouble. After a varied and exciting career out west where he was charged with adultery, mule thievery, swindling, and “open and notorious lewdness,” Henry Houghton returned to the family home in New York, bringing with him his mistress, a Mary E. Stanley, who had evidently been Henry’s partner in crime as well. With them was a toddler who was understood to have been their child, even though Mary was at the time married to another man. Mary Stanley’s death would have passed unremarked had it not been for a collection of letters she had written to a friend, which was soon brought to the attention of the authorities. In brief, these letters stated that Mrs. Houghton wished to perform an abortion on her. (It was alleged that Houghton supplemented her income as a professional—and, on occasion, fatally incompetent—abortionist.) When Mrs. Stanley refused, she attempted to give her patient certain “medicines” which Mrs. Stanley believed were intended to permanently rid the Houghtons of her as well. Faced with this uncooperative attitude, Mrs. Houghton “became cruel to her, and starved both herself and her child.” The question of why she remained in the household appeared to be answered by murky and never-clarified issues regarding the estate of Mrs. Houghton’s late estranged husband. It was said that she stubbornly stayed put in an effort to defend the interests of Mrs. Houghton’s other son, Frank, who was involved with a legal dispute with his mother over a certain piece of property. There was a good deal of nightmarishly complex litigation surrounding Dr. Houghton’s estate, and evidently Mrs. Stanley played some crucial role regarding the dispute over the distribution of Roland Houghton’s properties. According to these letters, Mrs. Stanley was attempting to act as some sort of a roadblock in schemes Henry and his mother were attempting in relation to the matter. After the local coroner and District Attorney had read their fill of these missives, their first act was to have Mrs. Houghton arrested. When Mrs. Houghton took the stand in her defense, it was said that she gave her testimony “fairly and with much plausibility.” She simply denied everything the dead woman had written. Mrs. Stanley, she said, was a designing criminal who had robbed her son “not only of his money, but of his good name.” She had allowed the pregnant woman to live in her house out of pure Christian charity. Mrs. Stanley’s death, on September 12th 1876, was of a “congestive chill” that came on so suddenly there was no time to send for a doctor. She admitted that she had practiced medicine from 1851 until the previous year, when she was threatened with imprisonment if she did not cease her unaccredited ministrations. She also conceded that Mrs. Stanley had threatened to “crush” the Houghton family, and that “something disagreeable” had occurred several months before that had inspired Mrs. Stanley to write these accusatory letters. However, it was also revealed that at the time of Mrs. Houghton’s arrest, certain family papers were seized by the authorities which corroborated much of what the deceased had alleged. After all this, it is quite startling to read that the jury ruled that Mary Stanley died of natural causes, “from hemorrhage and exhaustion while in labor.” The only way of explaining this conclusion (which seemed to have no evidence to back it up) is to note that from the newspaper reports, the jury was clearly on Mrs. Houghton’s side from the beginning. In fact, the jury attempted to halt the inquest very early on, claiming they had heard enough evidence to reach a verdict. The coroner and DA overruled them, insisting that they hear additional witnesses. Also, one of the jurors questioned a doctor who testified, asking if it wasn’t true that pregnant women were often prone to paranoid fancies, where they imagined dangers that did not exist. When the doctor admitted that such things were possible, this obviously sealed the deal for this panel. The reason for this obvious bias in favor of the defendant is, most unfortunately, unknown. The case was left open for further investigation, but as far as can be ascertained by a search of contemporary newspapers, the matter was closed as far as the authorities were concerned. Marie Houghton left the court a free woman, if not exactly one without a stain on her character. She died less than a year later, at the age of fifty-five, on September 3, 1877. One of the strangest things about this case is the fact that it has attracted so little attention, from that time to this. The only detailed contemporary accounts I have been able to uncover are a handful of articles from one newspaper, the Brooklyn Eagle, and two columns in the New York Herald which simply repeated some of the information published in the Eagle. Even though the story contained enough scandal to keep a platoon of yellow journalists in clover for years, it was otherwise ignored. Despite the fact that the central character was a figure well-known to anyone who has the slightest interest in Poe’s life, this odd little episode appears to be unknown to his biographers. It is a great pity deeper investigation in the matter appears impossible at this late date, as from what was reported, Marie Houghton was either the most viciously slandered woman of her era, or a monster Poe himself could not have created in his darkest fits of imagination. On this date in 1824, the last Englishman to hang for forgery, met his fate at Newgate prison. Henry Fauntleroy making his defense. 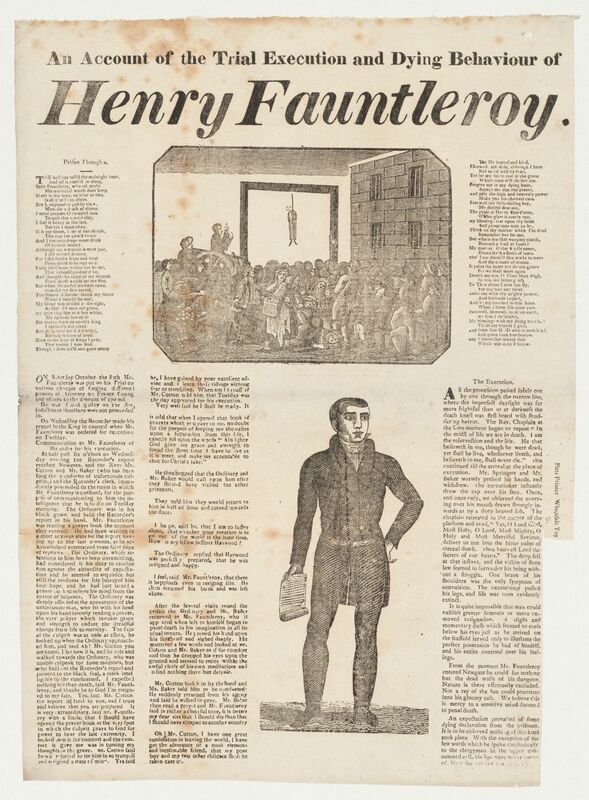 From this Harvard gallery (part of the university’s Crimes Virtual Collection) of the period’s hanging press, including a Fauntleroy broadsheet (huge image, with a generic-looking merchant type as the criminal). In a celebrated affair of the time, Fauntleroy was found to have inherited from his father a partnership in the foundering London bank Marsh, Sibbald & Co. Desperate to keep the concern alive by maintaining a front of normalcy, Fauntleroy serviced its obligations by forging powers of attorney authorizing him to sell stock that he was supposed to merely be holding for investors. In order to keep up the credit of our house, I have forged powers of attorney for the above sums and parties, and sold out to the amount here stated, and without the knowledge of my partners. I kept up the payments of the dividends, but made no entries of such payments in our books. Fauntleroy, of course, didn’t have the reach of the Smartest Guys in the Room; what he did by foul means the collapse of his firm might have (more or less) accomplished by what economists regard as fair. The firm, said the defendant, was in quite a fix. I was only twenty-two years of age, and the whole weight of an extensive but needy Banking establishment at once devolved upon me, and I found the concern deeply involved in advances to builders and others … and the necessity of making further advances to those persons to secure the sums in which they stood indebted. Translation: If you owe the bank £100, you’ve got a problem; if you owe the bank £100,000,000, the bank has a problem. It took a lot less than that to run Marsh, Sibbald & Co. into the ground. In this perplexed state the house continued until 1810, when its embarrassments were greatly increased, owing to the bankruptcies of Brickwood and others, which brought upon it a sudden demand for no less a sum than 170,000 £ … About 1814, 1815, and 1816, from the speculations with builders and brickmakers, & others, in which the house was engaged, it was called upon to provide funds to near 100,000 £, to avert the losses which would otherwise have visited it from these speculations. In 1819, the most responsible of our partners died, and we were called upon to pay over the amount of his capital, although the resources of the house were wholly inadequate to meet so large a payment. During these numerous and trying difficulties the house was nearly without resources, and the whole burthen of management falling upon me, I was driven to a state of distraction, in which I could meet with no relief from my partners, and, almost broken-hearted, I sought resources where I could, and so long as they were provided, and the credit of the house supported, no inquiries were made, either as to the manner in which they were procured, or as to the sources from whence they were derived. In almost Dickensian fashion, our malefactor reacted more violently to allegations that the embezzlement had been effected in pursuit of a debaucherous lifestyle than he did to the criminal charge itself; if his version of bourgeois rectitude and endemic financial criminality further to the crumbling facade of his enterprise rings true, the ascetic clerk’s mortal penalty on behalf of his crummy bank will be a timely reminder of the pleasures one ought to seek before life withdraws them (or at least — just ask Robert Rubin! — of the invaluable utility of the limited liability company). Having thus exposed all the necessities of the house, I declare that all the monies temporarily raised by me, were applied, not in one instance for my own separate purposes or expenses, but in every case they were immediately placed to the credit of the house in Berners-street, and applied to the payment of the pressing demands upon it. This fact does not rest on my assertion, as the transactions referred to are entered in the books now in the possession of the assignees, and to which I have had no access since my apprehension. 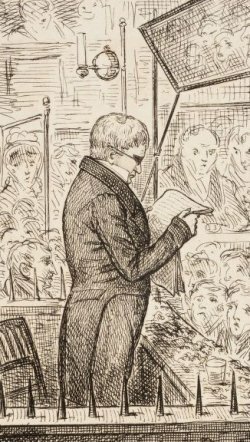 These books, I understand, are now in Court, and will confirm the truth of my statement; and to whatever account all the sums may be entered, whether to that of Stock, of Exchequer Bills, or to my private account, the whole went to the general funds of the Banking-house. A rumor circulated after Fauntleroy’s death — having something to do with the fame of the criminal, and something to do with what was reportedly his corpse’s unnaturally undamaged condition after the execution — that he had contrived to survive the hanging by slipping a silver tube down his throat, then absconded to live abroad. Though evidently baseless as a factual matter, the legend is paid tribute by Nathaniel Hawthorne’s The Blithedale Romance, with a mysterious banker named “Fauntleroy” whose backstory would have elicited a knowing wink from many a reader in his time … and ours. The wreck of his estate was divided among his creditors: His name, in a very brief space, was forgotten by the multitude who had passed it so diligently from mouth to mouth. Seldom, indeed, was it recalled, even by his closest former intimates. Nor could it have been otherwise. The man had laid no real touch on any mortal’s heart. Being a mere image, an optical delusion, created by the sunshine of prosperity, it was his law to vanish into the shadow of the first intervening cloud. He seemed to leave no vacancy; a phenomenon which, like many others that attended his brief career, went far to prove the illusiveness of his existence. On this date in 1838, seven white men were hanged for an unprovoked massacre of aborigines in Australia. A memorial stands over the the site of the Myall Creek Massacre. Image used with permission. Native life was cheap on the continent and countless brutalities blithely visited by European settlers have gone to that vast forgotten register of unavenged atrocities. The Myall Creek massacre was not atypical of such incidents, save in its outcome: it was the first execution of whites for crimes against Australia’s natives, a fact that aroused furious opposition in much of Australia’s settler population. “I knew the men were guilty of murder but I would never see a white man hanged for killing a black,” one juror told a newspaper. But he would see it, and soon. We want neither the classic nor the romantic savage here. We have far too many of the murderous wretches about us already. The whole gang of black animals are not worth the money the colonists will have to pay for printing the silly court documents on which we have already wasted too much time. That bilious sentiment, far from expunged in Australia, has an enduring symbol in the Myall Creek Massacre. The aboriginal victims of this day’s hanged are commemorated in a monument overlooking the scene of their deaths … and they have occasioned modern efforts at reconciliation, including some of the descendants of their murderers.